Bee, a reluctant hero, becomes entangled in the adventures of a mysterious puppy (…or is he a cat?) as they travel between reality and the void of Fishbowl Space. Created by Natasha Allegri, character designer and storyboard artist for Adventure Time, the anime-inspired project set a Kickstarter record after its initial success on Cartoon Hangover. Starring Allyn Rachel as Bee. A new Bee and PuppyCat series, Bee and PuppyCat: Lazy in Space is currently in production and will be premiering in 2019. 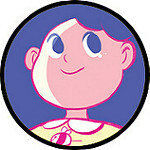 Visit the Bee and PuppyCat IMDB page. One of history’s most backed animation Kickstarters.